We have another good opportunity to trade forex in EURAUD. The resistance is at 1.2145. Its a good opportunity to get a position on the long side. There’s also news that EUR will receive an aid. So news and technical are complimenting each other. Keep stop loss at 1.2145 just in case. This entry was posted in Trading Signals by ForexPhil. Bookmark the permalink. Hi, what is your technical reason to buy the EURAUD? I have tried reading about using the ichimoku, isn’t this chart telling us we are in a strong downtrend? Do you use other indicators like stoc or macd? Can you recommend a site or a book where we can learn the same rules you are using for this indicator? Thanks! Hi mark, I only use ichimoku and the occasional moving average. Yes, its in a downtrend as indicated by ichimoku, but its a weak downtrend. 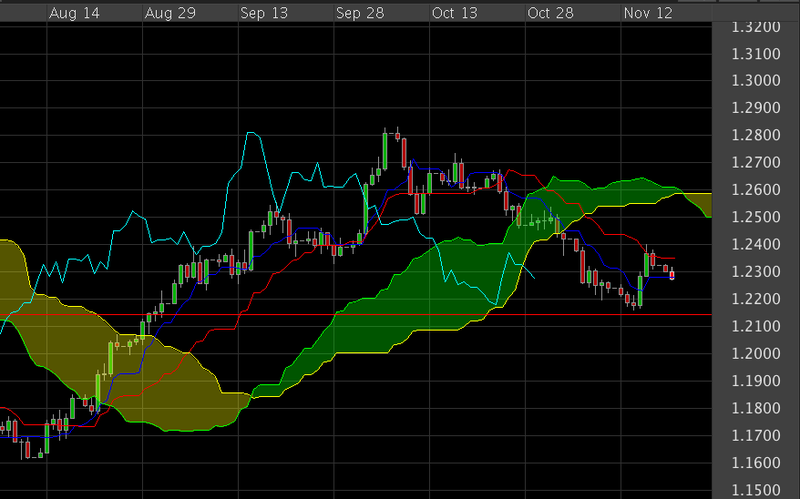 The cross from the kijun and tenkan above the cloud indicates a weak downtrend. So its only a matter of time before it reverses. The price is now in between the kijun and tenkan lines, which means the trend could be running out of fuel and starting to reverse. Tenkan is the blue line and Kijun is the red line that looked like a moving average. Mark, there are a lot of strategy in ichimoku on where to place your stop. Its more of a preference. Those lines, kijun, tenkan, chikou and the clouds can be used as both stop losses and take profits. I used the chikou as the stop loss in this trade. I use horizontal lines and price action for trading. I am exploring ichimoku because of your blog. I am very new to it and would like to know a good trading system using it. I hope you can share yours if you don’t mind. =) Also, I get confused when you post your gains. For ex. “AUDCAD trade went great. +538.1 pips! My account grew 100.81%” –how many percent of your capital are you risking? when you say you doubled your account does it mean the whole account or you doubled the money you risked? I was talking about my whole account. It was a 100.81% gain of the whole account. The only trade I took last week was AUDCAD and EURJPY. I was so sure of the AUDCAD that I added positions as it goes down. WOW! Maybe can you also share how you manage your money (trade positions). That would be a great help to newbies like me. Thanks! Mark, everything I know is documented in this site. From the time I made my first trade in demo up to this day now that I trade live. All you have to do is read.